By buying this product you can collect up to 52 loyalty points. Your cart will total 52 points that can be converted into a voucher of Rs. 5.20. It is a small, pumpkin-like fruit native in Indonesia. It is used widely and for several hundred years already in oriental cuisine as a spice. You might know it better for its extract that is a dietary supplement. You literally eat less and this very much improves your diet planning and efforts. This is not the only mechanism behind it, but it is an important one. This extract, shortly called HCA works in a way that it eliminates the feeling of hunger. It is a small, pumpkin-like fruit native in Indonesia. It is used widely and for several hundred years already in oriental cuisine as a spice. You might know it better for its extract that is a dietary supplement. You literally eat less and this very much improves your diet planning and efforts. This is not the only mechanism behind it, but it is an important one. This extract, shortly called HCA works in a way that it eliminates the feeling of hunger. HCA or Hydroxycitric acid is a natural extract of Garcinia Cambogia plant. It is a natural hunger suppressant. It also blocks the creation of fatty cells in your belly, the part of the body which has the most storage capacity for fat cells. It is an appetite suppressant that makes you eat less. It is keeping you from overeating and gaining weight. This is done through HCA’s natural ability to increase serotonin levels in your body. Serotonin is a neurotransmitter (lets call it “messenger”) which informs your brain that it is well fed. Serotonin is a contributor to feeling of well-being and happiness. So, increasing the level of serotonin makes you less hungry, and slightly happier. The other effect is that it stops creation of fatty cells from carbohydrate intake. This is done through blocking the levels of an enzyme named ATP Citrate Lyase. This enzyme is the link between the metabolism of carbohydrates and the production of fatty cells. Carbs are responsible for a lot of weight gaining so this benefit is really important. It has been shown that Garcinia Cambogia also helps strengthening ones immune system, lowering bad cholesterol level and also improves metabolism. These benefits are all important in weight loss programs, and generally in life. So far, I found no proofs or studies that show known and important side effects of HCA extract intake. Some people might have mild discomfort such as sleepiness or having to go to the bathroom a little more often, but these are not negative side effects. It is always recommended that You consult your physician first, prior to any supplement, not just Garcinia! It might turn out that you will have no side-effects whatsoever but being a little cautious always helps. Drink at least 6-8 glasses of water a day. A large number of supplements have diuretic properties (they extract water from your body) which means the lost water must be somehow put back into your organism. • Balances your lymph system! 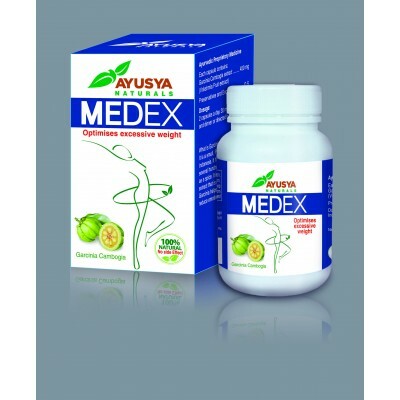 Clinical Studies & References About Medex Capsule Please Download PDF File.